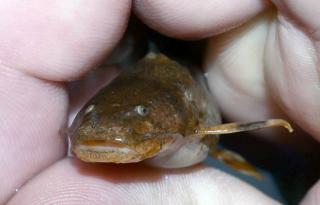 Etymology Rhyacoglanis, from the Greek rhyax = torrent + glanis = catfish; indicating a catfish inhabiting running waters in reference to the habitat of the genus. Gender masculine. Size 87mm or 3.4" SL. 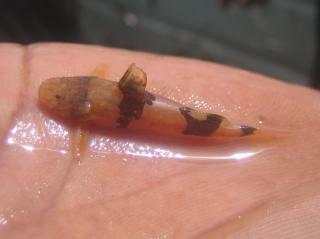 Find near, nearer or same sized spp. 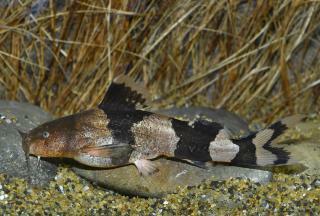 Identification Rhyacoglanis is distinguished from other Pseudopimelodidae by three synapomorphies: presence of a light blotch on the cheek; a connection between the middle of the dark caudal-fin stripe and the dark caudal-peduncle pigmentation; and 30-35 total vertebrae. References Proceedings of the Zoological Society of London 1887 (pt 2), pp 276, Pl. 21 (fig. 1).